I don't really like posting discontinued or hard to find products but I will definitely make an exception for Versace Heat V2033. I had never heard of it before stumbling upon it and since I came up empty handed searching for swatches, I decided this beauty totally deserved at least one post of its own. In case you're curious, it's my girl @the_asian_girl, she also has a tumblr page with amazing swatches. So, what do you think? Do you like V2033? What's your rarest beauty product? Wow, this is a really stunning color! 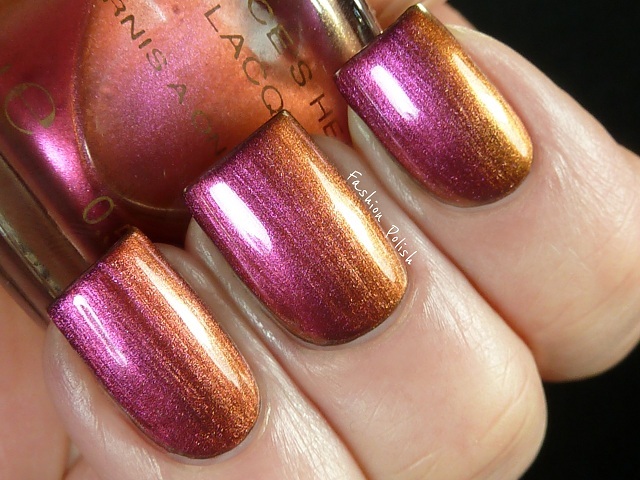 Reminds me of a brazillian polish we have here that has a chrome effect with pink and orange/gold, almost like that! Its gorgeous! like a rainbow. This is gorgeous! Thanks for sharing! 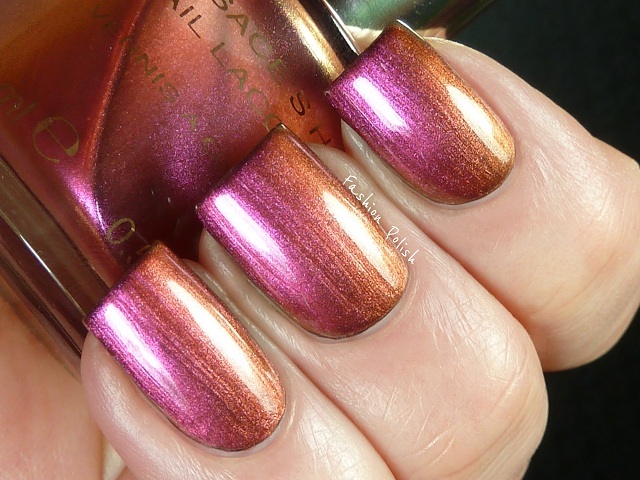 Makes me want to hunt down this polish. I don't know if I really have a rare beauty product. The polish that got me started was when my Grandmother treated me to a manicure for my birthday. I got a lot of compliments on my nails and I felt the color was unique and started hunting for it. I ended up going back to the salon to get a touch up so I could find the color!! It's China Glaze: Emotion, a gorgeous mauve/pink shimmer. It was discontinued when I ordered it online. I'm glad you posted it, it's absolutely gorgeous! Wow. Love the different colors this polish reflects. Beautiful. Whoop Whoop - Really want it - where can I buy it ????????? Whhop Whoop - I love ths !!!!!! Where can I buy it ?? Wow, this polish is so fabulous! I don't think I own any super rare polishes. But this makes me want some! I swear every swatch you do makes me want to buy it and I have bought quite a few! Your nails are spectacular and I wish I could have such flawless polish application! This color is amazing! That is gorgeous and would make the perfect summer pedi, love it! 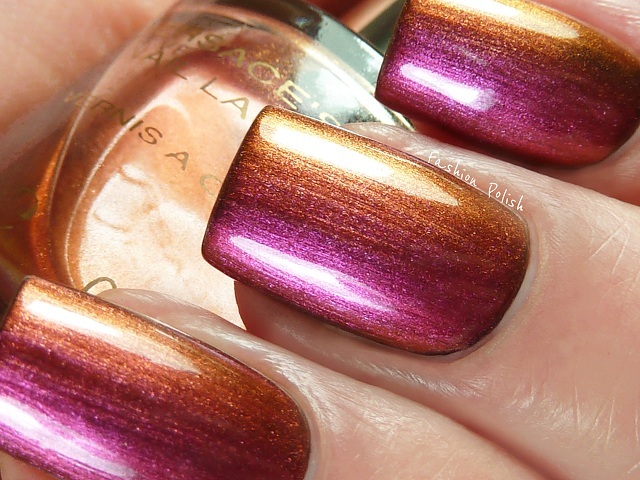 omg, this polish looks so beautiful :O I've never heard about it before! This nail polish it's really amazing, it's a pity that we cannot find him anymore, I loved him so much that I wanted one to call mine. Other beauty that we cannot find anymore in the market, it's the Holographic from Gosh, nº 549. 2nd would be my bottle of Clarins 230, and 3rd, Revlon Khaki Zing. O the M the G! it is beautiful!!!! Why did you put this colour over black? Wow I have never seen that trick - love it! Thanks!